Designing products for teens is challenging as they are an audience in a constant state of flux. As they grow and mature into adults, their tastes, habits and views change with them. However, this does provide a great opportunity to regularly engage with them about their data, to educate them about how their data is used, and keep them in control of their changing identities. Friendlee a social app aimed at teens that lets them subscribe to channels based on their interests, whether that's football or fashion, and gives them a feed they can contribute to and share. Friendlee suggests new channels based on the content they like. Research shows that teens are a sophisticated group of digital users, generally more aware of issues related to data transparency and trust online than their parents are. They understand that data is only meaningful in context and want to have granular control over the contexts in which their personal data is shared. Teens are also continuously evolving their sense of themselves and the world around them. Things they may identify with at 13 will no longer be true at 15 or 18 years old. When designing services for them, it's important to design with change in mind. This is especially important for digital services involving a feed: being transparent on how data is used allows to ensure that users are provided with meaningful content. Despite being a generally digitally aware group, teens span a broad range and younger teens can have little awareness of the data exchange between them and the services they use. The challenge was to give a teen, who is not yet fully data literate, an active role in managing their data. Are there better formats through which teens might prefer to engage with their data, for example, could it be delivered in a story rather than within settings? 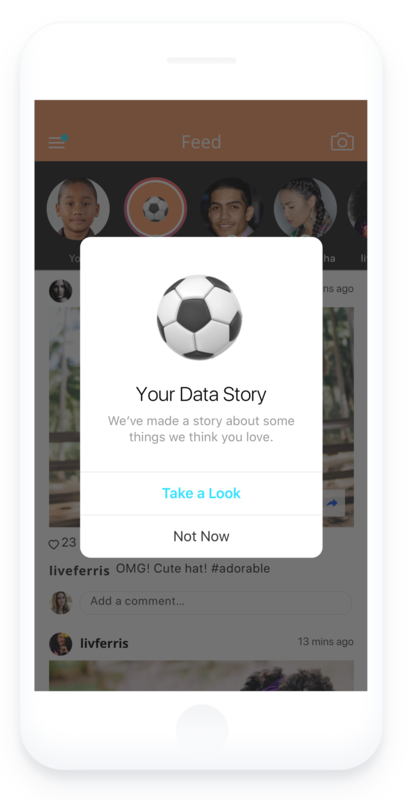 Friendlee uses an 'ephemeral story format', an experience already embedded in the app, to educate teens to understand and make choices about their data without having to actively look for data settings or deletion. Once they have used Friendlee for a while, it prompts them with a 'data story.' This story is about an interest that Friendlee identified, such as football, with the story showing content and actions that have made Friendlee believe they like football. At the end of the story, they are asked whether this is actually true using simple, conversational language. The language around the actions is purposely kept human and is based on self-reflection, not on a technical process like 'delete this data'. The teen is able to take control of their data without having any knowledge of activity logs or data settings. Instead, they can reflect on it in the context of their own self-identity. Directly engaging young people and inviting them to participate in the process of data deletion or de-ranking of content is something that most apps or services would shy away from. Friendlee took on this challenge head-on and explored the language and controls needed to engage younger people. 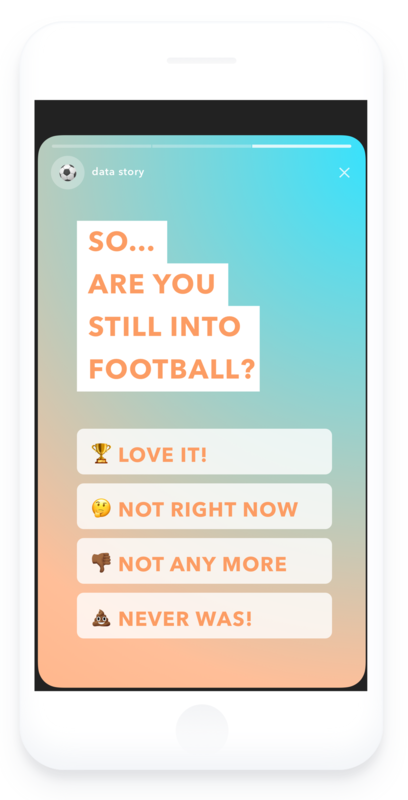 Love it - Friendlee would know to keep the data, and that the person is happy to be shown football content on their feed and be part of interest-based groups. Not Right Now - Friendlee would know to pause the display of football content on their feed and interest-based groups. No data would be deleted. Not Any More - Friendlee would begin to de-rank content about football in both frequency and prominence. Channels' subscriptions would be deleted and interests updated. Never Was - Friendlee would know that they'd gotten it wrong or that the teen had changed so substantially that football was no longer part of their identity and didn't want to be associated with it. All data on football would be deleted and they would be removed from interest groups. 'We also need to think carefully about how to ensure this tool is primarily about transparency and control of a user's data, not just another way to collect data from a user!' It would be interesting to push this further, and explore how we can empower users who don’t (yet) understand the mechanics of data to manage theirs. Cater for people's different levels of 'data-awareness'? Explore how this mechanism could evolve as the user gets more experienced with data usage? Explain to people why they are alerted about certain kinds of content? Give people the ability to decide what kind of content they'd like to be alerted about? Emphasise the educational aspects of the UI? TTC Labs is a cross-industry effort to create innovative design solutions that put people in control of their privacy. Initiated and supported by Facebook, and built on collaboration, the movement has grown to include over sixty organisations, including major global businesses, startups, civic organisations and academic institutions. Welcome to TTC Labs, where we design for trust, transparency and control (TTC). Let's walk through how we use data on this site. We use 1 first-party cookie to remember if you've consented to cookies. We also have 3 third-party cookies from Google Analytics to provide aggregate data on people who visit our site. This data includes info such as how you discovered us, where in the world you're from, what other pages you visit and which browser or device you're using. We use this information to improve the user experience of our website.